The characteristics of autism spectrum disorders (ASD) present unique challenges, not only to people themselves affected, but also to counselling professionals. 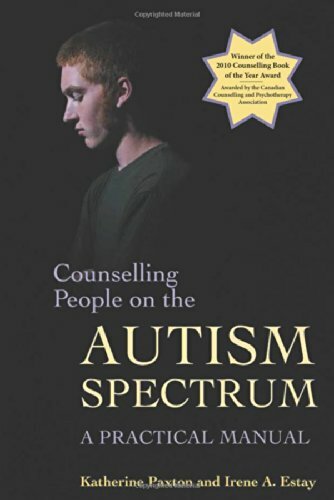 This manual provides counselling techniques that work not only for professionals, but also for individuals either coping with being on the spectrum themselves, or living with someone who has an ASD. Regardless of intellectual and linguistic ability, people on the autism spectrum often have significant impairments in emotional expression, regulation, and recognition, and they are known to have higher rates of depression and anxiety than the general population. This comprehensive book shows how to develop the tools necessary to help people on the spectrum cope with their emotions, anxieties, and confusion about the often overwhelming world that surrounds them. Illustrated with useful case studies, it covers a range situations where counselling may be helpful for individuals with ASD, both children and adults, families where a member is on the spectrum, and couples where a partner has ASD. It also addresses specific issues, including depression, anxiety, emotional regulation, social skills, and stress, with effective strategies for dealing with each issue. As well as being indispensable for counsellors, this book provides valuable information and advice for anyone working with people and families affected by ASDs.